Free Shipping Included! WiFi Camera - Wireless IP Camera with Two-Way Audio, Night Vision Camera, 2.4GHz & 720P Camera for Pet Baby Monitor, Home Security Camera Motion Detection Indoor Camera (White) by BOOCOSA at Mamboe. MPN: wific168. Hurry! Limited time offer. Offer valid only while supplies last. 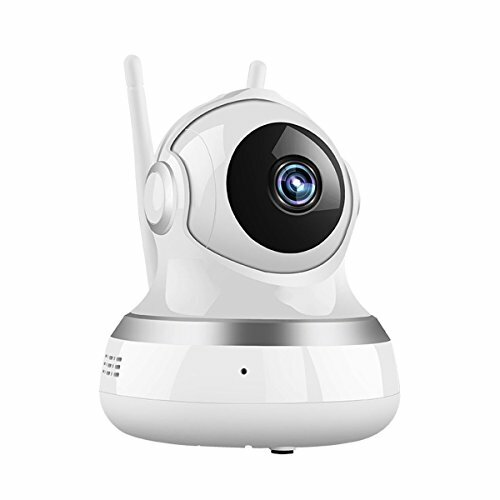 FINE AND SMOOTH VIDEO RECORDING: Enjoy HD quality video recording with our wireless security camera. It records at 720P and will record crystal clear images even in darkness thank to a powerful night vision feature with 4 IR LEDs. MULTIPURPOSE: Apart from keeping your home safe, you can use this surveillance IP camera as a baby monitor, or nanny cam. It is a Wi-Fi enabled motion detection camera with a two-way talk system that will perfectly fit several uses. UPDATED SOFTWARE AND EASY WIFI CONTROL: Our motion detection Wi-Fi nanny cam runs on updated firmware that delivers dependable performance. You can also connect it to your smartphone via Wi-Fi for easy remove access and control. FAST, RELIABLE STORAGE CAPABILITIES: This surveillance camera supports up to 64GB MicroSD card for video storage. It can however function without a memory card by recording and uploading to a cloud storage live, giving you unlimited possibilities. MOTION DETECTION FOR INCREASED EFFICIENCY: An accurate motion detection feature makes this night vision camera highly memory and power efficient. It will only start recording when motion is detected thus saving on precious memory space. Click 'Add to Cart' now! If you have any questions about this product by BOOCOSA, contact us by completing and submitting the form below. If you are looking for a specif part number, please include it with your message.